Underwater Pilots are Manuel G. Richter and Gregoire Vanoli. They are a german band creating electronic pop music with subtile darkness, melodic hooklines and dancable beats. Mostly they are located in the area of dark-electro and the future-pop-scene. We met the first time for working on a remix and noticed that we had a similar way of feeling music. But we also noticed our completely different ways of producing. While working together, we saw how we could complement each other and decided to start a project. This was the very beginning of Underwater Pilots. 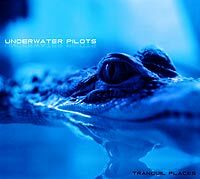 Why we´ve chosen Underwater Pilots as our name? We love spherical and liquid sounds... .. kind of an underwater feeling . And we both love to sit in our cockpits, pressing buttons and turning wheels... In summer 2002 we created a first demo. We worked on some older tracks from Manu, giving them a more modern touch. We sent that demo to Repo Records and... it worked! In summer 2003 we started to work on the album. At that time Manu was living in Völkerhausen, Germany. A tiny village in the mountains near Hameln, surrounded by forests. It was an ideal place to compose music: quiet and peaceful. At that time we had already prepared a lot of ideas for songs. We decided wich ones would make their way onto the album. After that we created sounds, arranged the songs, wrote and recorded the vocals, and so on. But at that time it was already clear that Manu will be moving to Leipzig. So we decided to name our album "Tranquil Places". It is dedicated to that village, the time we spent there and our studio cat Sammy. The song "Leaving Home" is about leaving a beloved place and the insecurity that comes when leaving everything behind. After Völkerhausen each one of us worked seperately on the songs. Manu moved to Leipzig and Greg returned to Hamburg. We decided to work via the internet. That way we were able to stay up to date with the current versions of the songs and we could exchange critics and new ideas. In april 2004 we met in Leipzig to finalize the songs. We spent two weeks recording some missing vocal-tracks, mixing and discussing what was left to do - mostly small details in the songs. Except "Ice Cream" and "Welcome To The World" these songs completely changed their face during this period. And we had some photo sessions with our photographer Jörn Stubbe. In november 2004 the debut Album "Tranquil Places" was released by Repo Records. Through winter 2004 / 2005 we spent some time with preparing the live concept and giving interviews for some german and international magazines. In april we played the first small concert in Leipzig. One month later we played the second show at the Wave Gotik Treffen. We produced a remix for the Funker Vogt maxi "Fallen Hero" and a remix of the song "Plug'n'Die" for Dope Stars Inc. Meanwhile "Tranquil Places" was released in Russia by Soyus Music. In october 2005 we played some gigs with Funker Vogt. In november and december Greg and Manu produced a complete remix cd for Floating Stone under the name of Manu´s solo project Xabec. Floating Stone is an acoustic side project of Jeff and Niko, both are members of Anne Clark´s band.